Disneyland? Meh. Universal Studios? Been there, done that. Robot Land? Now, we're talking. 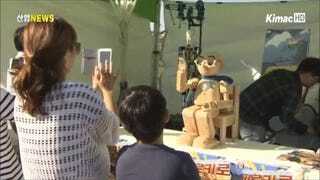 For years now, there has been talk in South Korea about a robot theme park. Construction was supposed to start in 2009, but it never happened. (Heck, several years ago, I spent some time in South Korea talking to researchers about it for a magazine article.) There was a website and lots of talk, but construction never started. Until now. Recently, the park held a groundbreaking ceremony to mark the start of construction. That means Robot Land is really happening. Or rather, building Robot Land is really happening! Above, you can see an image from the ceremony. Robot Land will cost US$700 million to complete and is slated to open between 2015 and 2016. Hey, Rome wasn't built in a day, and Robot Land won't be either.